San Francisco’s Transbay Transit Center is now under construction in the Financial District, just one block south of Market Street, San Francisco’s main street. Financing, design, construction, and operation is the responsibility of the Transbay Joint Powers Authority (TJPA) created by the city and county of San Francisco, the Alameda-Contra Costa Transit District, the Peninsula Corridor Joint Powers Board, and Caltrans (ex officio). California state law allows public agencies to work together by signing joint powers agreements that may be cooperative arrangements among existing agencies or, as with the TJPA, new, separate agencies. The Transit Center will connect eight Bay Area counties and the state through 11 transportation systems: AC Transit (Alameda and eastern Contra Costa counties), BART (Bay Area Rapid Transit), Caltrain (SF Bay Peninsula), Golden Gate Transit (Marin County), Greyhound, Muni (San Francisco), SamTrans (San Mateo County), WestCAT Lynx (western Contra Costa County), Amtrak, Paratransit and the California High-Speed Rail line between San Francisco and Los Angeles/Anaheim. No. 2 shows the temporary terminal. No. 3 shows the new elevated bus ramp that will provide direct bus connections to and from the San Francisco–Oakland Bay Bridge. No. 4 indicates Folsom Street, the center of the new pedestrian-friendly neighborhood. No. 5 shows the approximately 40 acre Transit Center District. No. 6 shows the 1.3-mile underground rail line from Caltrain’s current terminus. No. 7 indicates the out-of-service bus storage under the I-80 freeway. No. 9 signals the new underground Caltrain station. Phase 1 of the project, to be completed in 2017, includes the million square foot terminal and foundations for two below-grade train levels. San Francisco’s Planning Department and its Office of Community Investment and Infrastructure worked with the TJPA to guide future growth in this once low-rise manufacturing part of the city’s downtown. The district will be high-density and mixed-use, with commercial and retail space, hotels, market-rate housing, affordable housing and 11 acres of open space. 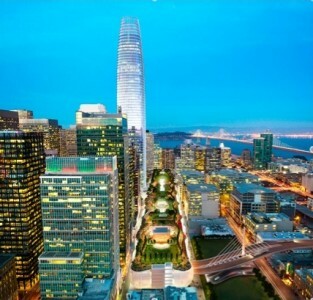 A limited number of buildings are allowed to exceed San Francisco’s 550-foot height limit. The Transbay Transit Center’s funding reflects the collaborative nature of the undertaking with national, state, and local governments contributing to the approximately 2.3 billion Phase 1 construction costs. A $171 million loan from a new U.S. Department of Transportation program that supports important national or regional surface transportation projects—the Transportation Infrastructure Finance and Innovation Act of 1998 (TIFIA)—allows the TJPA to minimize the borrowing needed for Phase 1. It will be repaid with the increased taxes generated by the increased land value of the commercial, retail, and housing developed by the project. The U.S. Department of Transportation’s Federal Railroad Administration, responsible for dispersing American Recovery and Reinvestment Act of 2009 high-speed rail funds, committed $400 million to the project. Federal Transportation Administration grants provided $68 million. The state of California contributed approximately 12 acres of state-owned land that was available because several elevated freeways in the vicinity of the old Transbay Terminal were damaged by the 1989 Loma Prieta earthquake and had to be demolished. Land sales are contributing approximately $515.6 million. Regional Measures 1 & 2, whereby voters approved increases in Bay Area bridge tolls, will contribute $197 million. The county of San Mateo and the city and county of San Francisco are also contributing. The table below shows the contributors and the amounts as of June 2016. The Transbay Transit Center is the only major urban transit hub to be built in the U.S. in the past 70 years. Program costs for the district are estimated at about $6 billion, escalated to the year of expenditure. They include replacing the former terminal, extending Caltrain and California High Speed Rail underground 1.3 miles from Caltrain’s current terminus, and infrastructure for the new neighborhood. The Transit Center is expected to serve more than 100,000 passengers each weekday and up to 45 million people per year. The goal is to make public transportation convenient for everyone in the Bay Area and to be the catalyst for developing a new downtown neighborhood for residents, workers and visitors. Author: Dr. Linda L. Day is emeritus professor of city and regional planning at California Polytechnic State University and contributing faculty to the public policy and administration program at Walden University. Dr. Day authored This House is Just Right: A Design Guide to Choosing a Home and Neighborhood. She blogs for Planetizen.com about urban redevelopment and municipal finance. Follow Dr. Day on Twitter @LindaLouiseDay1.